Kalamazoo, Mich. – The Gustavus men’s tennis duo of Amrik Donkena (Sr., Rochester, Minn.) and Mya Smith-Dennis (Jr., Savage, Minn.) advanced to the quarterfinal round of the 2013 NCAA Men’s Tennis Doubles Championship after a convincing 6-2, 6-3 win over Tanner Brown and Erik Lim of Johns Hopkins University. The tandem will play again Friday, May 24th at 4:30 p.m. against Nicholas Ballou and Raymond Worley of California Lutheran University. For the second time this spring, the doubles team of Donkena and Smith-Dennis defeated Brown and Lim of Johns Hopkins. 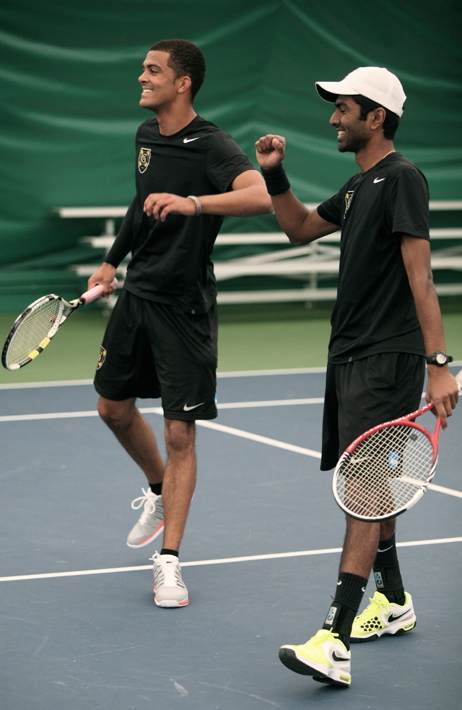 On February 23rd of this year, the Gustie duo defeated Johns Hopkins at the No.1 doubles position 8-6 in the fifth place match of the 2013 Intercollegiate Tennis Association (ITA) Indoor Championships held in St. Peter. Thursday’s victory for Donkena and Smith-Dennis was in the first round of the NCAA Tournament and comes on the heels of a second place finish in last year’s NCAA Doubles Championship. Donkena also competed in the Singles Championship on Thursday. The senior fell at the hands of Nicholas Ballou of Cal Lutheran University 6-1, 6-0. Donkena finishes his singles season with a record of 12-12 in his senior campaign. He also reached the NCAA Singles Championship in each of his last three seasons while representing the Three Crowns.